Maj. Gen. Henry W. Lawton, "General Walton"
We never get to meet "General Walton" in the Little Colonel Stories, but we sure get to hear a lot about him. In fact, General "Walton" was one of the most famous military figures of his time to have been so nearly forgotten a century later. You would have had to come from Mars in 1900 not to have heard of him. 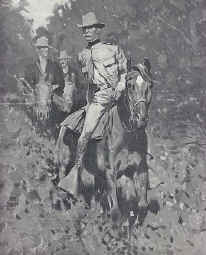 After a long and brilliant career, beginning in the Civil War when he won the Presidential Medal of Honor, continuing into the Indian Wars, where he was in command of the unit that captured the Apache Chief Geronimo, to the Spanish-American War where he achieved glory in the Cuban Campaign in the same battle more famously known for Teddy Roosevelt's and the Rough Riders' charge on San Juan Hill, General Lawton became the only American General to die in battle during the conflicts spawned by the Spanish-American War. At the Battle for San Mateo, Philippine Islands, Lawton was killed by a sharpshooter under the command of a Philippine insurgent general named Lucerio Geronimo. Irony knows no limits. And here is where the story becomes so important for the development of the Little Colonel books. It was only after the General's demise that his wife and children, who customarily followed him wherever he went, returned to the United States, now in relative poverty. Without the General's income for support, and to pay off the debt for their home in Redlands, California, Mrs. Lawton & the children moved to Louisville (and a house that is a center for much of the story of The Little Colonel's Holidays.) A national subscription for the family of the fallen hero (by school children donating pennies, no less) helped pay off the debts and for a new home for the family (The Beeches) in 1901. Because of the close knit circle of friends and relations in Louisville and Pewee ("Lloydsboro") Valley, Mrs. Lawton became a close friend of Annie Fellows Johnston and with her charm and imagination, a significant character and contributor to the stories. Here is the classic dark cloud with the silver lining. If General Lawton had lived, it's unlikely that the Little Colonel books, had they continued at all, would have in any way resembled what we know today. There would be none of the adventures of Allison, Kitty, Ranald or Elise, nor the guiding hand of Mrs. Walton throughout the volumes. Historical speculation can go wild here as well. At the extreme: Teddy Roosevelt, by then a close friend of General Lawton, had remarked that he would have chosen Lawton as his Secretary of War had he lived. Roosevelt's second choice, William Howard Taft, actually became the next President of the United States, much as a result of Roosevelt's backing. Now what if... What if General Lawton had lived. Is there a small chance that our beloved "Walton's" could have become America's First Family? At the very least, the next president would likely have been someone other than Taft. General Lawton is buried at Arlington National Cemetery along with his wife, and daughter Catherine/"Kitty" ( Section 2, Grave 841). "As for the reception, Gen. Lawton found there a distinguished company to welcome him in true Kentucky style. It was a hearty, unmistakable welcome, and the General seemed to regard it as such. But for all that, the writer could not help saying to himself that the General seemed a trifle bored at times, that he would rather have been back at the nursery at the Culbertson's, playing with the boys."